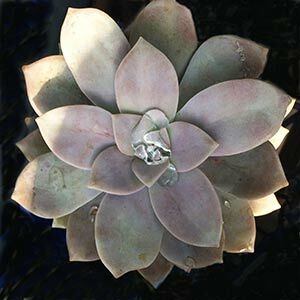 A rosette forming succulent Graptopetalum pentandrum ‘Superbum’ is distinctive by its very flat dusky pink leaves. The plant will form offsets of these rosettes over time and as will eventually form a small shrub. White and red flowers that rise above one wiry stems are an added attraction. Originally from Mexico this attractive succulent looks great in a container in a warm sunny position, low care and rewarding to grow. Individual rosettes look great in containers, they will reach 10cm and larger across. As the plant matures it forms offsets and will develop into a large clump. Usually grown in containers as a feature plant. Graptopetalum pentandrum ‘Superbum’ can also be grown in a rock garden, or in the right climate, mass planted as a ground cover plant. A well drained growing medium is essential. Like many succulents Graptopetalum pentandrum ‘Superbum’ does not require a lot of water, overwatering is the main cause of problems. Allow the soil to dry between waterings, no more than once a month is usually sufficient. A little liquid fertiliser every month from spring to summer is sufficient. Soil – Well drained specialist succulent mix. Foliage – Thick fleshy Lavender Pink. Flowers – White to yellow with red on wiry stems. Easy by leaf cuttings, also possible by allowing hanging rosettes to strike roots and then removing. Leaf cuttings should be allowed to callous for 3 days and then gently pushed into the propagating mix, almost sitting on the surface, yet in firm contact. Place in good filtered light and mist with a spray bottle every day or so.Do not water until good signs of new growth are evident.